With over 1,700 attendees expected, the 6-day event will be the world’s largest gathering to focus exclusively on SAFe and its community of practice. 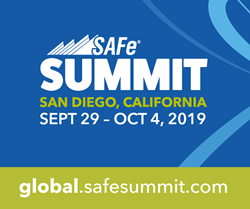 Scaled Agile, Inc., provider of the world’s leading framework for enterprise agility, today announced open registration for the 2019 Global SAFe Summit, which will take place September 29 – October 4 at the Marriott Marquis in San Diego, CA. With over 1,700 attendees expected, the 6-day event will be the world’s largest gathering to focus exclusively on the Scaled Agile Framework® (SAFe) and its community of practice. The 2019 Global SAFe Summit is a ‘big tent’ event for everyone engaged with SAFe—practitioners, trainers, consultants, Scaled Agile Partners, and enterprise business leaders. The event will feature pre- and post-conference training and workshops and a two-day main conference. Attendees will have opportunities to build skills, exchange knowledge, network with each other, connect with thought leaders and influencers, and see firsthand how enterprises are leveraging SAFe to achieve business agility and enable digital transformation initiatives. Pre-conference training covers a wide range of topics and SAFe applications. Classes and certifications include: SAFe® Advanced Scrum Master, SAFe® DevOps, SAFe® for Architects, SAFe® Release Train Engineer, and SAFe® Product Owner/Product Manager. A dedicated Partner track and Partner networking expo will focus on building Partner success in marketing, supporting, and deploying SAFe products and services. For attendees seeking consulting, training, or platform solutions, Scaled Agile Partners will be exhibiting during the main conference, making this the only venue where an exclusively SAFe-focused audience can engage with vendors specializing in SAFe. Registration is open at global.safesummit.com, with super early-bird pricing available until April 17, 2019. In addition to the 2019 Global SAFe Summit in San Diego, CA, Scaled Agile will be hosting the 2019 European SAFe Summit in The Hague, Netherlands May 7 – 10. The 2019 European SAFe Summit, Europe, will feature content and customer success stories most relevant to SAFe professionals in Europe and surrounding countries. Learn more at europe.safesummit.com. Scaled Agile, Inc., is the provider of SAFe®, the world’s leading framework for enterprise agility. Through learning and certification, a global partner network, and a growing community of over 400,000 trained professionals, Scaled Agile helps enterprises build better systems, increase employee engagement, and improve business outcomes. Scaled Agile is a contributing member of the Pledge 1% corporate philanthropy and community service movement. Learn about Scaled Agile and SAFe at scaledagile.com.